COWAL: a male Hen Harrier hunting between Millhouse and Ardlamont House (Allister Hamilton). MID-ARGYLL: now 160 Chaffinches feeding in the garden at Cairnbaan. Also small flocks (up to 40+) of Meadow Pipits, appearing/on the move, in fields around the Moine Mhor (Jim Dickson). TIREE: a 3CY Iceland Gull (the long-staying bird), 1 juv Glaucous Gull, 1f Scaup, 55 Goldeneye and 2 Gadwall at Loch a’ Phuill. 1 Woodcock at Carnan Mor (John Bowler). Also 2 Linnets at Traigh Bhagh found and photographed by Steph Cope – just the 2nd January record in 100 years on Tiree! (Steph Cope per John Bowler). 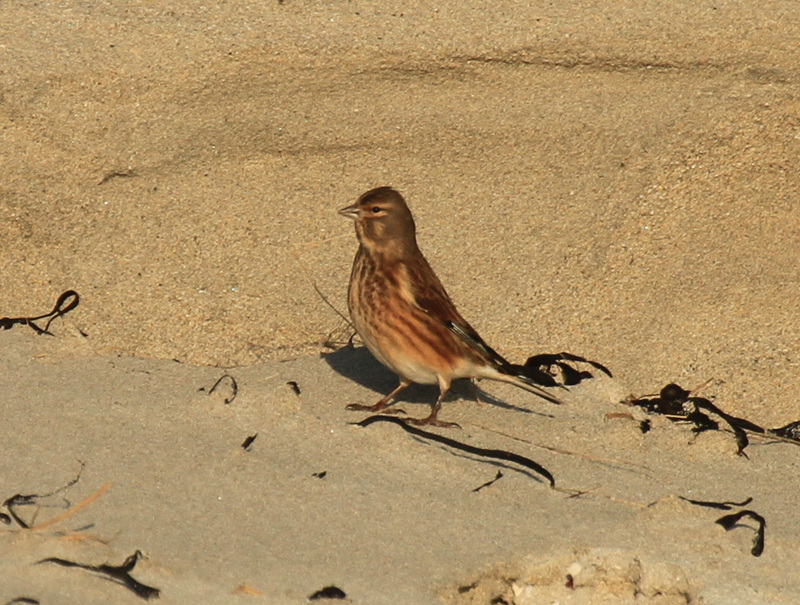 Linnet – Traigh Bhagh, Tiree 22 Jan (Steph Cope).